Unhappy with your pool temperature? Chances are your solar controller is not working properly. A solar controller is sometimes overlooked, yet is the most important component behind a solar pool heating system. 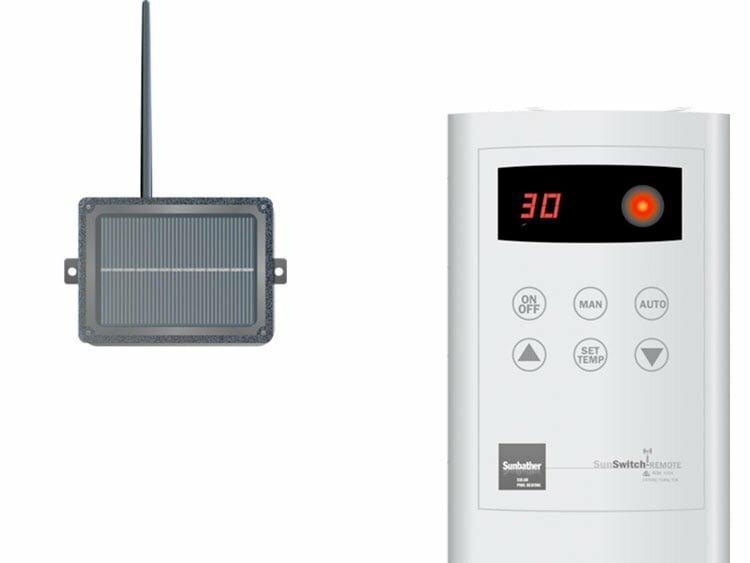 SunSwitch controllers not only look better, they are the simplest and smartest solar controller available compatible with any type of solar pool heating system. Available in wireless and wired models, SunSwitch has every situation covered. SPASA’s annual Gold Medal is awarded to the pool product that demonstrates excellence in design, innovation, and practicality. SunSwitch was Product-of–the-Year in 2004. Attractive design, easy to use features, and in built smarts made SunSwitch the obvious choice for this prestigious award. SunSwitch has a unique Energy Saving mode. It works to keep your pool hotter for longer. Most controllers turn off once your pool reaches its temperature, but SunSwitch constantly monitors the pool and roof temperatures and turns back on when required. Click for more about ES and other smarts…. SunSwitch can be installed on any solar system. Simply mount a backing plate to a wall. Then slide the SunSwitch onto the plate. It’s compatible with all types of solar systems. So heat your pool faster with SunSwitch.